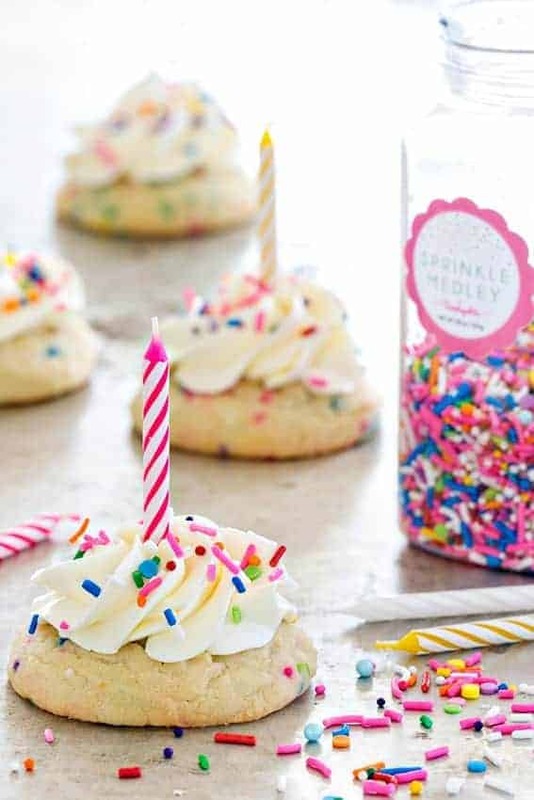 Birthday Cake Cookies are everything you love about birthday cake in cookie form – sprinkles, buttercream frosting, and more sprinkles. When we were deciding on the plans for our new home, one room was an absolute must. It wasn’t a home office or playroom for Elle, nope – it was a walk-in pantry. A place that I could deck out with floor to ceiling shelving to accommodate my massive collection of baking pans, small appliances and enough sprinkles to last me a lifetime. When we sat down with our builder, none of the plans we were interested in included a walk-in pantry. I had a slight diva moment, I mean how can anyone possibly have enough space to store everything in a tiny kitchen pantry?! That’s when Eric reminded me that my everything is a tad bit different from everyone else’s everything. What he was saying was that 7 styles of bundt pans and a gazillion bags of chocolate chips is not the norm. We ended up adding an extra room that is intended to be used for additional laundry space or a small home office, but we’re adding in custom shelving and drawers, and I couldn’t be more excited to organize all the sprinkles. Speaking of sprinkles, I recently placed an order to Sweetapolita’s Sprinkle Shop and I’m officially obsessed with every single one of her creations. Words cannot even begin to describe how beautiful her custom blends are – you just have to check them out for yourself. You guys, she has a blend called Happy Unicorn and now she officially has all my money. I told you, I’m obsessed. 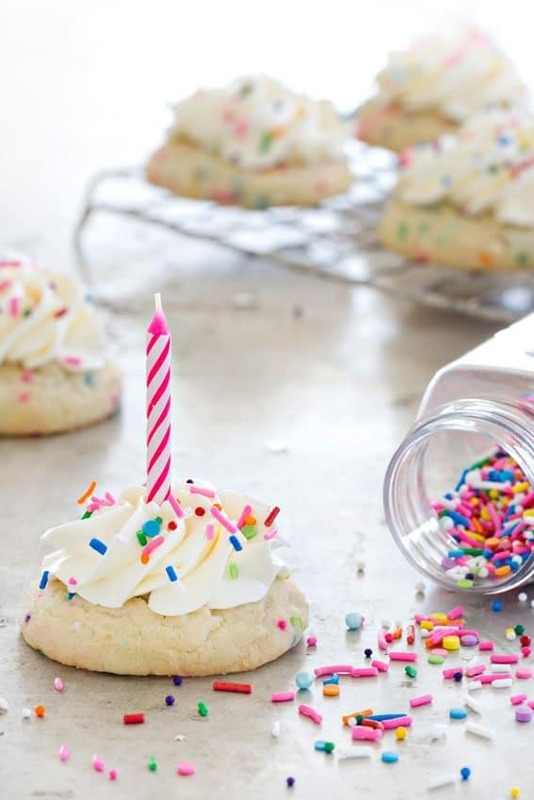 Sweetapolita’s Birthday Party sprinkles are what inspired these Birthday Cake Cookies. They’re soft, chewy, topped with a swirl of vanilla buttercream and loaded with sprinkles. Although I’m no stranger to doctored up cake mixes, I wanted to create these cookies from scratch, but if you’re short on time, these Cake Mix Cookies are a definite winner! 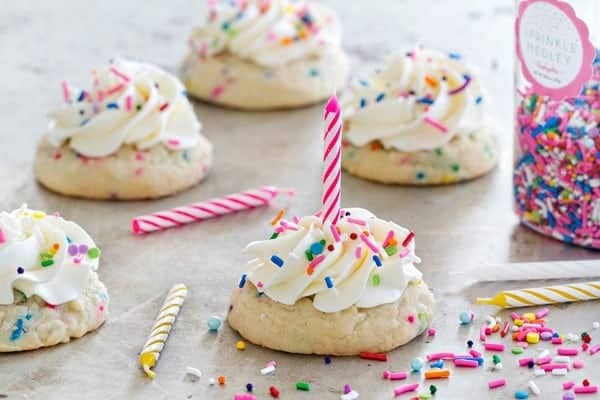 Of course, this Birthday Cake Cookies recipe is perfect for celebrating anyone’s special day, but they’re also great for small celebrations like getting through the first few weeks of school or getting a brand new pantry installed. If you’re as obsessed with sprinkles as I am, be sure to check out my Funfetti Sugar Cookie Bars and Funfetti Cupcakes! It’s so funny to hear you talking about a special baking pantry because I have always said how when I build a house one day that is my number one request! I hope you post pictures of how it turns out. These cookies are also so festive and fun. Love it! How fun are these cookies?!?!?! Ok, I need to check out those sprinkles. I mean Happy Unicorn? I see my money going straight to sprinkles now!!! 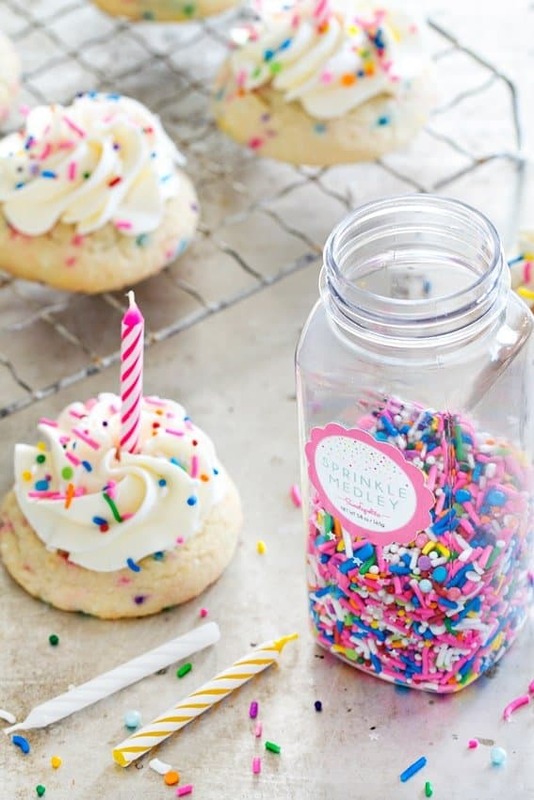 Cookies with frosting and sprinkles are the best!! So cute as well! I want to build and live in a Tiny House. I have been fighting with EVERYONE who keeps saying that i’ll have to get rid of all my baking stuff – and I keep pointing out that all the people on TinyHouse nation have ski equipment and such – why can’t my pans go where their ski equipment goes??? Anyway – this is a long-winded way of saying how much I envy your pantry!!! Of course I remember you! 57?! That is incredible – clearly I need to step up my bundt pan game. We moved from Toledo to Cleveland, so I haven’t been into the Toledo WS in quite some time. I hope all is well! These cookies are an absolute delight! Cookies and frosting = life perfected. Good on you for getting customised shelves and drawers! Thank you! I hope you like them! Are these cookies wlsweet enough to not have the frosting? I want to bake them for my son’s class birthday bash they have at the end of the month and the school does not want us bringing in too much sugar. Omg I was looking everywhere for cake flavoured cookies that were made from scratching and didn’t use cake mix!! But I have a few questions: this recipe makes 36 cookies right? And can I use baking soda instead of baking powder? Hi Laura – Yes, this recipe makes about 36 cookies. I have not made this recipe with baking soda instead of baking powder so I’m not sure of the result. If you happen to give it a try, I’d love to know how they turned out. Thanks so much for stopping by.